Deeply serrated leaves! Purple-red leaves hold their color better than any other dissectum! Acer palmatum dissectum 'Red Dragon' (Red Dragon Weeping Japanese Maple) * Part shade * Zones 5-8 * 5-10' tall * 5-8' wide Deeply serrated leaves! Purple-red leaves hold their color better than any other dissectum! Flaming red Fall color! 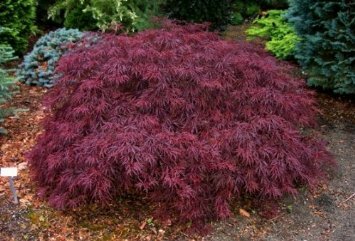 Acer palmatum dissectum 'Red Dragon' Deep purple-red color that holds well in sun or shade better than any other red dissectum. New leaves emerge bright scarlet in the spring and then turn a dark burgundy. Flaming maroon scarlet is the fall color. A nice compact cascading mound reaching a height of 7-8 feet. Companion Plants: Goes well with 'Viridis' and 'Green Filigree Lace' Japanese Maples as well as Black Bamboo. Check out our store for these great plants! This is a must to add to your landscaping. Currently these are Approx 12-18 inches tall, grafted red dragon 2 year old potted plant. Every order has care directions sent in the box with the plant.